And in the process, it takes a character from what's perhaps Marvel's worst outing to date (of the ones I've seen) – Sam Raimi's Spider-Man 3 – and turns him into an unlikely hero. I remember Venom vaguely from that other mostly forgettable movie (which was a shame, because Raimi's first two Spider-Man movies were terrific), where our friendly neighbourhood web slinger was forced to confront a guy named Eddie Brock, who'd been infected with some kind of space goo that turned him into, in this case, a super villain. Here, however, we have no Spidey at all; rather, it's Eddie's story alone this time, and at the beginning of the movie we discover that he's a TV investigative reporter of the 60 Minutes ilk – willing to destroy people in order to get his story – and his typically outsized "journalists' ego" leads to him losing his job, his fiancé, and basically everything in his life that was important to him. Yeah, it was all self-inflicted, so that part's good. I loved seeing the uppity "journalist" get his comeuppance (even though he was technically right about the person he was trying to nail), and in this case it leads to Eddie living a life as the loser he always was (except he had a great media job to prop him up before), until one magical day a whistleblower working for the dude who got him fired sneaks him into the super secret scientific complex where he gets infected by that alien goo, turning him into Venom. It's not an immediate change and it's kind of cool seeing the transition, as Eddie and his alter ego learn to live together as one. And of course, the rest of the movie sees Eddie/Venom taking on the bad guys and staking his claim as the grossest superhero since The Spleen. My favourite superhero stories are the origin ones, where we see the genesis of the hero from the "ordinary" human being – Peter Parker becoming Spider-Man, Kal El becoming Superman (okay he wasn't ordinary, but he was while he lived on Krypton), Bruce Wayne becoming Batman, etc. etc. etc., and that's what makes Venom work best here. I'm not sure Venom 2 will be as interesting (looks like we have that to look forward to, according to one of the scenes that interrupts the closing credits of this relatively short – 92-ish minutes – movie), but Venom 1 was interesting enough that I'll probably watch it. On the downside, we also have the typical Hollywood/liberal "capitalist bad" villain, this time personified by Carlton Drake (Riz Ahmed – and isn't it nice to see a "non-white" villain?) as an Elon Musk-like techno-zealot bent on changing the world for what he sees as the better. Hey, at least he isn't orange! And of course, there needs to be a super villain for Venom to defeat, and in this case it's another alien symbiote hiding in plain sight in another person, and known as Riot. There are some gross parts, but while this is definitely not a movie my wife would watch, it wasn't nearly as "R Rated" (other than some completely unnecessary profanity) as the Deadpools. There's plenty of action and some good CG effects (Venom him/itself appears more CG than not) and Tom Hardy absolutely nails his characterization, though Michelle Williams as Eddie's love interest doesn't have a lot to do other than look concerned. It's really Hardy's movie, and that's fine; most of the other characters appear to be mostly along for the ride, except for Drake and his whistle blower Dr. Dora Skirth (Jenny Slate, who meets her fate too early – though necessarily – in the story). I had requested the 4K disc version for review but Sony's PR people sent the conventional Blu-ray instead, which was a shame. Fortunately, it's a very good Blu-ray, with video and sound excellent enough that I really wished they'd sent the proper disc. But what can you do? Sony's Blu-ray also comes with a DVD and a code for digital download. The Blu-ray of the movie, at an aspect ratio of 2.40:1, looks as great as 1080p can (and that's pretty darn good!). Detail is ultra sharp, from the textures on costumes to the sets and to the complexion of people's faces. I missed the HDR treatment, but the brightness and colour of the 1080p disc are still first rate. Audio comes via a loud and in your face DTS-HD Master Audio 5.1 soundtrack. It isn't as raucous as, say, a recent Christopher Nolan outing or Mission Impossible: Fallout, where you risk having your neighbours heading to your home theatre with pitchforks and torches, but it's close. All the main channels, and the low frequency effects channel, are put to excellent use, though there seemed to be a bit of a lack to the surrounds. Extras abound, too, including "Venom Mode," which will give you pop-up info as the film unfolds, talking about how the movie is related to the comic books, and other trivia. "From Symbiote to Screen" features cast and crew interviews along with filmmaker Kevin Smith as they talk about the character's history and its transition to film. "The Anti-Hero" is basically the same thing with a different focus. "The Lethal Protection in Action" looks at the stunts and action scenes, while "Venom Vision" showcases the film's director, Ruben Fleischer. There are also looks at the film's design, including previsualization segments and you get two music videos, one from Eminem and one by Post Malone and Swae Lee, neither of whom I'd heard of before. There are also some deleted scenes and trailers. One of the most interesting extras, to me, was the short sneak peek of Spider-Man: Into the Spider-Verse. This is an animated Spider-Man flick (which, undoubtedly surprising to no one, now features a black Spidey) that features a really great look to the animation and characters. The reimagining to a more politically correct Spider-Man makes me not want to see the movie, but that animation and design is so intriguing I might just check it out anyway. 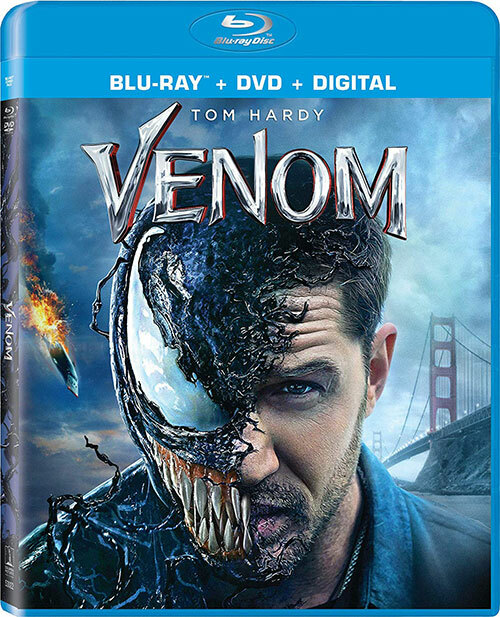 Meanwhile, while Venom is one of the weaker of the Marvel movie franchise, it's worth a look anyway, if only because of Tom Hardy's exquisite performance. I didn't know what to expect going in, and I expected very little, but I must admit to having been pleasantly surprised. It's no Ben-Hur, but what is?